HBO’s Game of Thrones, based on George R.R. Martin’s series of fantasy novels, continues to be a cable television powerhouse and to keep fans on the edge of their seats. If season three delivered the stunning goods with what was dubbed “the red wedding” then season four certainly delivered even more satisfying results, with what fans across social media dubbed “the purple wedding.” It brought the death of the much hated character Joffrey Baratheon (Jack Gleeson), and as central as his character seemed, he may be the one death up to this point that was almost universally lauded by all fans. Yes, he was hated that much. His passing set up a major point of conflict and suspense for the season, however, and that is the suspicion of murder and subsequent trial of the much maligned Tyrion Lannister (Peter Dinklage). Tyrion’s character has grown a lot over the past few seasons. He has gone from a bad guy and drunkard to someone far more nuanced, the protector of Sansa Stark (Sophie Turner), of all things. To lose him now – the penalty for killing the king is, after all, death — would be a major blow. Meanwhile, up North, Jon Snow (Kit Harington) readies for the battle of his life as the wildlings, including his lover Ygritte (Rose Leslie) ready to attack the Night’s Watch and the wall. Greatly outnumbered, their battle is the crowning point of season four. But in between, we have a major journey for the Stark sisters, Sansa and Arya (Maisie Williams), it’s a journey that will lead them to the same place, and have Sansa shaking off her innocence once and for all. If there is one thing that remains true in this season of Game of Thrones, it is that no one’s life is safe, and the battle to claim the Iron Throne rages on. It is another fantastic, addictive, and mesmerizing season of blood, drama, backstabbing, and surprises, with an awesome production. 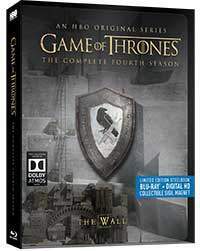 The video encodement remains the same as on the previous Blu-ray release of Season 4 of Game of Thrones. The HD production for Game of Thrones, shot on Arri Alexa cameras with Cooke S4 and Angenieux Optimo lenses continues to impress. It has a film-like appearance despite being from a digital source in this AVC 1080p encodement to Blu-ray from HBO. It is wonderfully textured and detailed, has extended shadow details and strong contrast. The true highlights of these new SteelBook reissues from HBO are the Atmos remixes, which will playback as Dolby TrueHD 7.1 on non-Atmos systems. The Atmos mix is spectacular. Replacing the previous DTS-HD Master Audio 5.1 mix, which itself was exceptional, the new Atmos mix adds an added sense of depth, space, and width. Sounds like crowd noise, atmospherics, and solid discrete effects now move around and surround you, or get into your head, so to speak. The Politics of Power: A Look Back at Season 3 (1.78:1; HD; 00:25:02) – Revisit the brutal events of Season 3 to see the power shifts that define Westeros at the start of Season 4. Bastards of Westeros (1.78:1; HD; 00:07:16) – Hear showrunners David Benioff & D.B. Weiss and author George R.R. Martin discuss the role bastards play in the Seven Kingdoms. Behind the Battle for the Wall (1.78:1; HD; 00:37:11) – Follow the cast and crew as they create the most ambitious battle to date. This extensive documentary explores the challenges of putting on one of the series’ most intense episodes, with never-before-seen material. The Fallen: A Roundtable (1.78:1; SD; 00:29:37) – Writer Bryan Cogman sits down with a few of the many cast members who meet their demise in Season 4. From first learning of their deaths to shooting their final scenes, this 30-minute feature will shed light on what it’s like to live – and die – in the Game of Thrones world. George R.R. Martin may not be able to finish his series of novels as yet, but for folks like me who are quite satisfied with the series, season four is another thrilling season of Game of Thrones. The new Atmos mix makes the series even more enjoyable, although the SteelBook edition doesn’t add more than that other than the cool packaging and collectible sigil. Season four of Game of Thrones offers up another delicious season of deliciously devilish plot twists, shocking deaths, and of course, the "purple wedding." The Atmos mix kicks it up another notch.